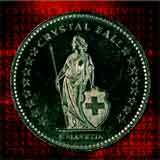 Crystal Ball is back with their fourth album, Hellvetia. Remember that album Louis XIV from Chroming Rose? The artwork for this album looks strikingly similar to that album, deosn't it? Anyway, I digress. The Virtual Empire album served as my introduction to the Swiss quintet Crystal Ball, and that album still makes it into my regular listening rotation. When I heard of the release of Hellvetia, I became very eager to hear some new material from this band. Although I wouldn't immediately rank this album ahead of Virtual Empire (time will tell as I really enjoy that album), Crystal Ball has not disappointed me in the least! Hellvetia is fine dose of melodic hard rock sure to please fans of the band and hard rock fans in general. If you bands such as Shakra, PC69, Gotthard, and Axxis, you can't miss Crystal Ball. As expected, this album is chocked full of infectious melodies and thick harmony vocals. Mark Sweeney's unmistakable, unique voice sounds great as usual, adding that special, personalized touch to the music of Crystal Ball. He is very aware of his vocal abilities, as he doesn't make the mistake of belting out high notes that are simply out of his range. The guitar work has made strides since the band's last offering. You'll notice that the riffs are more forceful and the solos are more flamboyant and standout much more compared to the last opus. Furthermore, this album is about as consistent as the sun rising each morning. From the first track all the way to the tenth, the guys deliver catchy, guitar driven hard rock tunes. Each song flows very naturally into the next, meaning that the album seems to come to a close very quickly! The lone ballad, Wasn't It Love is saved for last (unless you have the Euro edition which comes with a twelfth bonus track). There are no sleeper tracks on this disc, each song jumps on you instantly. One thing I do miss is the hint of power metal the band served up in spots on Virtual Empire. For example, the opening track of Virtual Empire, Hands of God is a soaring track that came off really well and if anything, it served to mix things up a little bit. The songs on Hellvetia all fit into the melodic hard rock mold, whereas a power metallish number such as Hands of God could have been slipped into the mix on this album without disturbing the flow. Well, this is a small complaint really since the songs that DO appear on the album are all top quality. For this album, it seems like the guys came up with a winning formula and stuck with it for the duration of the album. That's a lot better than coming up with a boring, cookie cutter type of formula and sticking with that for an entire album. We've all heard those types of albums unfortunately. I can tell you that Crystal Ball is playing inspiring, top notch melodic hard rock and you won't get bored with it! Amongst bands such as Shakra, Pretty Maids, Bonfire (well, not their new album), PC69, Axxis, and Magnum, Crystal Ball should gather even more attention from fans of this genre with each passing album. If you've even owned an album from any of these aforementioned bands, I highly suggest you check out Crystal Ball.